Masterton Library had its beginnings in March 1867 when a meeting of interested citizens resolved to establish a Literary Institute and Reading Room. In 1872, another of Masterton’s unique organisations, the Masterton Trust Lands Trust was established with the aims of supporting educational and cultural institutions. The library became the recipient of the first Trust grant of 160 pounds to assist with the erection of a library building. 110 years later the Trust Lands Trust again made it possible for Masterton to benefit from a new library building when, in 1981 they agreed to donate $75,000 towards the new library thus making it possible for the Council to proceed with their plans. 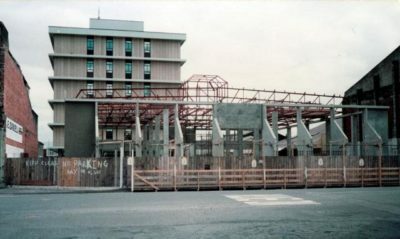 Building started almost immediately, with the library opening to the public in October 1982. Donations have played a large part in enabling the Masterton Library to provide the services currently enjoyed by residents. When the current building was opened in 1982, donations of cash and goods valued at $128,000 had been given. One of the most significant was a gift of $30,000 from Mrs Doris Madeley, a longtime resident of Masterton. The Masterton Trust Lands Trust and the Masterton Licensing Trust commissioned local artist Jim Greig to produce two ceramic panels which now adorn the doorways of the library. The Masterton Spinners and Weavers created a wall hanging for the children’s section and the Wairarapa Embroiderers Guild constructed an embroidered wall hanging consisting of 110 panels, with each panel commemorating an event of significance in the history of the Wairarapa. This feature brings many visitors to the library each year. Both the Trust Lands Trust and the Masterton Licensing Trust have remained strong supporters of the library with regular annual donations and strong support for the annual summer reading programme. In 1995, the C.B. Lai building on the southern boundary of the library, which had become an earthquake risk, was demolished. The Masterton District Council purchased the site and held a competition to design a garden for the area. The winning design, by Carterton man, Craig Whitwell, called for the inclusion of a statue or water feature. 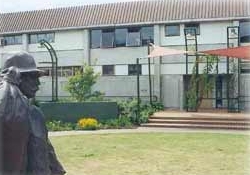 The Masterton Licensing Trust was celebrating its 50th anniversary in 1997, and donated a statue of Russian Jack, the last of the swaggers, to Masterton in commemoration. The statue was unveiled in December 1999.